The truest test of any great company is how well it protects the safety and health of its people. At the Savannah River Site (SRS), our record speaks for itself. SRS Operations employees achieved the lowest fiscal year first quarter injury rates on record. 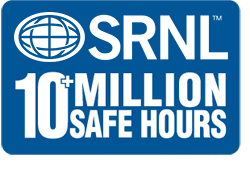 SRS Construction employees have achieved over 23 million man hours without a lost time injury or illness. Construction employees have not missed work in over 11 years due to injuries. SRS continues to build on the rich site safety legacy of being one of the safest sites in the DOE complex and one of the safest major industrial sites in the world. Protecting workers, the public, the environment, and national security interest are our highest priorities. We are proud of our strong safety tradition, and will stop work rather than compromise the safety and health of a fellow co-worker. Because we share this strong conviction, our daily work in support of our nation and the world is managed with the highest regards to safety. We conduct all aspects of our work safely, continuously improving in pursuit of injury-and incident-free performance. We will be recognized for our world-class safety culture that builds on our history and anticipates the challenges of our current and future missions. These are the key concepts that must stay in the forefront of our thoughts as we work each day. 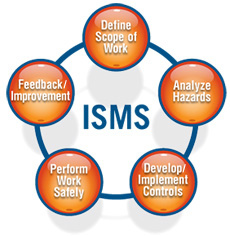 • The Integrated Safety Management System (ISMS) is the framework for our safety. • Our safety includes industrial, nuclear, security, environmental and radiological aspects. • We believe in zero incidents and injuries. • Our leaders will provide a safe environment. • We work safely as a condition of employment. • We report, investigate and act upon all incidents and safety issues. • We are empowered to prevent incidents. • We view all of our experiences, including our mistakes, as opportunities to learn. Over the years, SRS has received many commendations for our safety performance. In 2000, SRS was awarded STAR Status in the Department of Energy Voluntary Protection Program (DOE-VPP). VPP is a joint Department of Energy and Occupational Safety and Health Administration-sponsored program focusing on every aspect of an organization’s safety and health initiatives. SRS is the largest and most complex organization ever to receive STAR status recognition in the VPP process. Paramount to the awarding of VPP status is a strong management commitment to safety and employee involvement in all phases of the program. We believe we have both. Although SRS has received numerous local and national safety awards and honors and, although our injury frequency rates across the board are among the very best in the world, we will not be content until all injuries and illnesses are eliminated. To that end, we have implemented BBS throughout our site. Our Behavior-Based Safety process was designed to be an integral component of our Integrated Safety Management System (ISMS). It supports the ISMS principles and every one of its core functions. BBS has empowered our national recognition within the VPP as the second site in the nation to achieve the Legacy of Stars award.